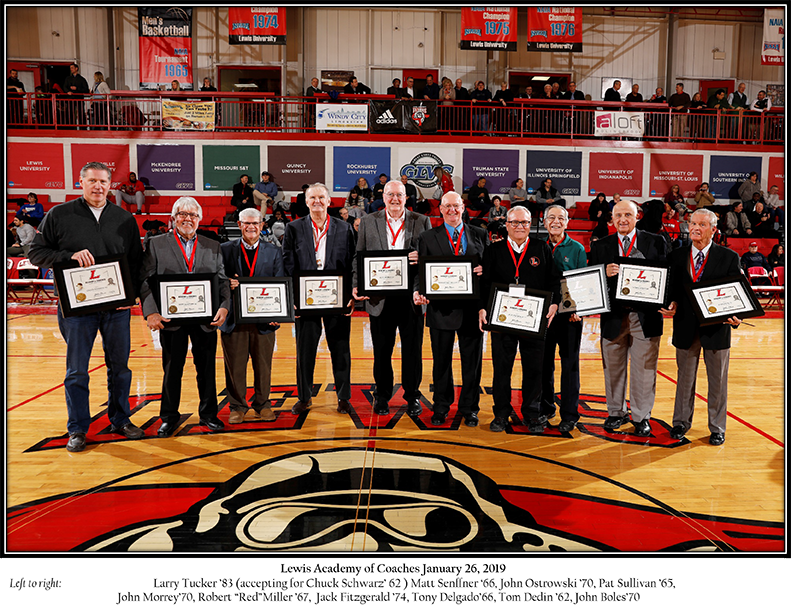 The inaugural class of the Lewis Academy of Coaches was honored January 26. The 10-member class was honored as part of Alumni Day during halftime of the men's basketball game against Rockhurst. "To the best of my knowledge there was not a curriculum offered in coaching while these men attended Lewis, but their accomplishments certainly suggested otherwise and their shared experiences at Lewis University helped shape them into the finest coaches in the country," Dr. Planek said. John Boles, a 1970 graduate of Lewis, began his coaching career at Saint Xavier University where he spent seven seasons before moving on to the University of Louisville for two years. He joined the Chicago White Sox system as a manager of their Rookie League affiliate, the GCL White Sox in 1981. Boles rose through the ranks eventually serving as manager for the Florida Marlins for two stints. Following his stint as a manger, he returned to the front office working for the Los Angeles Dodgers as senior advisor for baseball operations. In 2005, Boles joined the Seattle Mariners as special assistant to the executive vice president and general manager, serving also as a scout. In 2012, he rejoined the Royals as a senior advisor to general manager Dayton Moore. Thomas Dedin, a 1962 graduate of Lewis, succeeded Gillespie as the Flyer skipper and athletic director for two years. He led Lewis to a fourth place finish at the NAIA World Series in 1977 and to the 1978 NAIA Tournament. Dedin went on to become the head baseball coach at the University of Illinois from 1979-1987 where he led the Illini to Big 10 Championships in 1981, 1982 and 1985. He then spent 12 years as the baseball coach at Regis University. In his 23 years as a baseball coach he coached six future major leagues, two of whom spent at least a decade in the show. Tony Delgado, a 1966 Lewis graduate, was an assistant baseball coach on Lewis' first National Championship team in 1974. Delgado succeeded Paul Ruddy as men's basketball coach at Lewis in 1972 and coached the team for six seasons. He moved onto St. Francis in 1980 after coaching stints in baseball, basketball and tennis at Illinois Tech and Lewis. He served as Gillespie's top assistant with the Saints until Gillespie retired in 1995. Delgado was named his successor and led St. Francis for 10 seasons accumulating a record of 296-271 and eight winning seasons. Jack Fitzgerald, a 1974 graduate of Lewis, spent 17 years as the head boys' basketball coach at Leo High School where he guided his teams to four Catholic League titles and one conference championship. He then coached at Richards High School from 1994-2000. While at Richards High, he recorded 20-plus wins in four of his six seasons while also securing three SICA North titles. Fitzgerald also spent six years as an assistant coach at St. Xavier and is now working as a scout for the Miami Heat. Robert "Red" Miller, a 1967 graduate of Lewis, was drafted by the Washington Senators in the ninth round of the 1966 Major League Baseball draft. It was a draft that included future Hall of Famer Reggie Jackson. Miller became the baseball coach at Gordon Tech (now DePaul College Prep) and guided the Rams for nearly four decades. He was inducted in the Chicago Catholic League Hall of Fame in 2006 and received the Illinois High School Baseball Coaches Association's Distinguished Service Award in 2006. John Morrey, a 1970 Lewis graduate, began his coaching career at Cass Junior High School as a teacher and coach of three sports. In 1976, he joined Gillespie in establishing the baseball program at St. Francis where he served as an assistant coach as well as assistant athletic director. In 1980, Morrey became the head baseball coach at St. Xavier guiding the Cougars to a record of 574-379 in his 13 years. He led his teams to District 20 championships in 1981, 1982 and 1988. Morrey's 1982 team finished fourth at the NAIA World Series and his 1988 team finished third at the NAIA World Series. He was named the NAIA's Coach of the Year in 1988 after guiding the Cougars to a 58-25 record. Morrey then served as the head baseball coach at Xavier University from 1993-2004 before returning to St. Xavier as an assistant coach until 2014. John Ostrowski, a 1970 Lewis graduate, took over the baseball program at Benedictine in 1973 and guided the Eagles for 43 years. His teams went 990-742-16 (a .571 winning percentage) during his tenure, winning at least 20 games 32 times, including the last four years, and more than 25 on 16 occasions. Benedictine won 16 conference titles and made eight appearances in the NCAA Tournament. He became just the 10th coach in NCAA Division III history to win 900 games and only the sixth to do so at the same school. In addition to his baseball duties, Ostrowski served as an assistant football coach at Benedictine for many years and also held the positions of assistant athletic director and acting director of athletics. Matthew Senffner graduated from Lewis in 1966 and was the head football coach for nearly 40 years at Providence Catholic. He finished his career with a record of 300-114-1 and guided the Celtics to nine state championships in 18 seasons and also served as the school's athletic director. Senffner was inducted into the inaugural Providence Catholic Green and White Hall of Fame in 2004. He played for legendary coach Gordie Gillespie at Joliet Catholic as an offensive and defensive tackle in 1960 and 1961. Chuck Schwarz, a 1962 graduate of Lewis, built St. Laurence High School boys basketball into powerhouse during the 1970s turning out a succession of Division I recruits. He became the head coach at Lewis in 1978 and guided the program during its transition to Division II and the Great Lakes Valley Conference. His 1981-82 finished 20-9 and won the school's first GLVC title. His teams won 20 or more games and advanced to the NCAA Tournament five straight seasons and won three GLVC titles. He mentored two GLVC Players of the Year in Larry Tucker (1981-82) and Tom Niego (1985-86). Schwarz became the Director of Athletics at Loyola University in 1987 and was there until 1999 when he announced his retirement. Pat Sullivan was valedictorian for the Lewis class of 1965. He spent 34 years at the University of St. Francis in various roles as coach, administrator and an executive. On the basketball court, Sullivan led the Saints to a 506-505 record (a .501 winning percentage), four Chicagoland Collegiate Athletic Conference regular season championships, two CCAC Tournament Championships and two appearances in the NAIA National Tournament in 1994 and 1996. He led his teams to first- or second-place finishes in the CCAC 15 times in 18 years. More than wins, he the teacher was most proud of his 172 graduating seniors from the basketball team. Sullivan has been inducted into seven different halls of fame at every level of competition and was named coach of the year on multiple occasions from the NAIA, CCAC and at the high school level. He also served as an assistant principal, college guidance counselor and varsity basketball coach at Providence High School. He was the recipient of the 2018 Great Lakes Valley Conference's Dr. Charles Bertram Alumni Award of Distinction.